As stitchers you know how long it takes to stitch a Christmas stocking, so when Judy finished stitching this trio of stockings for her kids, she hit upon a unique display idea. 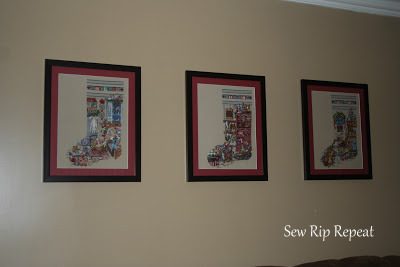 Instead of stitching them into actual stockings, she mounted them and framed them. They are quite lovely! To see close-up photos of each one, visit Judy’s blog, Sew Rip Repeat.